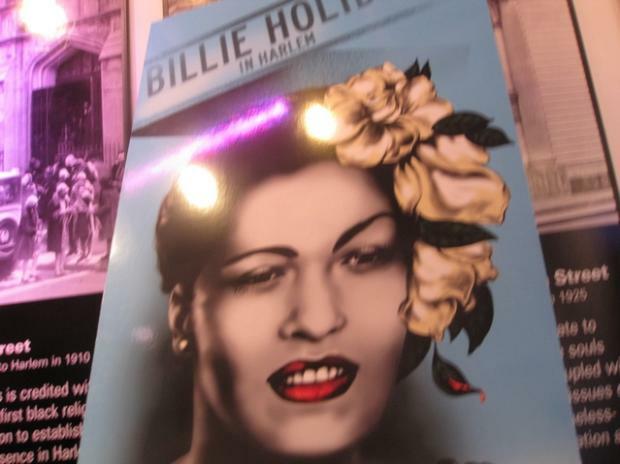 HARLEM — When artist Corine Campbell thought about Harlem music, jazz great Billie Holiday came to mind. "I felt jazz stood out among the music genres," the 23-year-old said while standing next to a painting of Holiday that she completed using the Photoshop paint tool. "As I began drawing, the symbols came together like lyrics. Now, Campbell's depiction of Holiday, along with works representing Jimi Hendrix and Josephine Baker, is one of six different banner designs celebrating Black Music Month that will hang along 125th Street for the next year as part of the "Bid on Culture" project. A project of the 125th Street Business Improvement District, the Harlem Arts Alliance and the Harlem Community Development Corporation, two dozen 8-foot tall banners will hang from Morningside to Fifth avenues. The winners, chosen from 41 entries, were awarded $1,000. Now in its third year, the goal of the project is not just to beautify 125th Street. "Showing the links between art, culture and business is just a natural," said Wayne Benjamin, director of residential development for the Harlem Community Development Corporation. Artist Misha McGlown created two of the winning banners. The first is a painting of Baker and the other is an image of Hendrix with a line that pays tribute to the Apollo Theater's role in the history of Black music. Tomo Mori, who has studied African and Latin dance for a decade, painted "Somos la Musica," an image of a dancer using various patches of color. Photographer Hubert Williams' work titled "True Colors" is an image of a man playing the trombone. "I was really proud of this image. When I sent it in I said I'm going to win," Williams joked at the banner unveiling. Soyca Mphahlele's "New Color" is a creative representation of Harlem's streets with typographical representation of the different types of music that are found here. "When I'm out at night I see the lights of Harlem," said Mphahlele. Barbara Askins, president and CEO of the 125th Street BID said the project has grown each year. When the banner project first started, the business improvement district had difficulty attracting sponsors. This year, there were several sponsors. "We want our banners to be the best in the city, and right now i would say they are," said Askins.